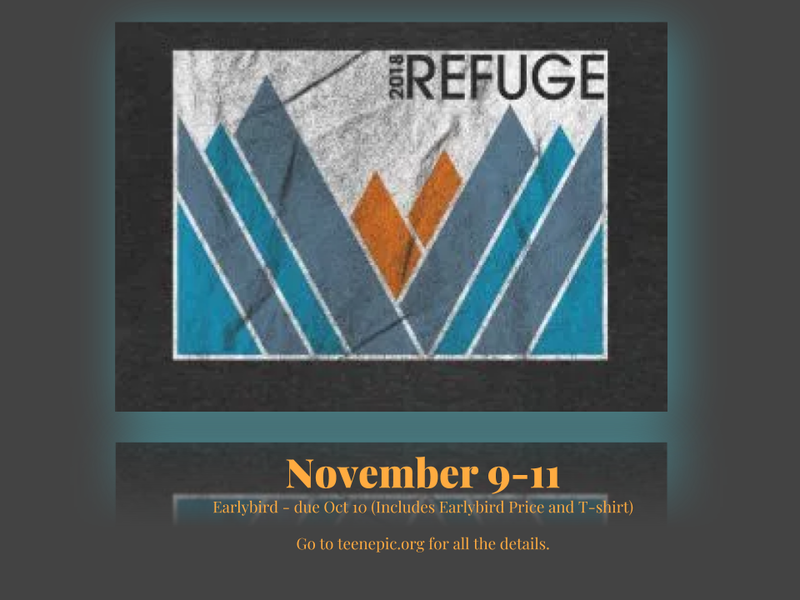 Refuge is an areawide retreat held at Babler Outdoor Education Center. If you haven’t been to youth group lately, you’ve missed the forms!!! EARLY BIRD DUE THIS WEDNESDAY, OCT 10!!! Here are some things you need to know!! Return the form to Mike with your correct registration fee. (Please use an Event Envelope if possible). Be at the building by 6:45 to pack the trailer Friday night – November 9. Make sure you eat dinner BEFORE you arrive! Only bring what you can carry…remember the cabins are a bit of a walk to get to especially if you’re carrying all your stuff! We will return to Lafayette by the end of worship time on Sunday – November 11. Don’t hesitate to email, text or call (leave a voicemail or I will assume it’s not important) if you have any questions. YOU ARE EXPECTED to take at least one shower over the course of the weekend!!! So bring a towel and soap!!! You are discouraged from driving separately, however, if you need to meet us there, please let Mike know. Babler State Park hosts Refuge. We use the Outdoor Education Center with lodging in heated cabins, showers in your cabins, meals on Saturday and breakfast on Sunday, Friday night and Saturday night snacks, and lots of fun! BIBLE, Sleeping bag, pillow, toiletries, towel, pen, notebook, flashlight, water bottle, a positive attitude. Sporting equipment, games, musical instruments. (Whatever you bring, understand the risks involved in things getting lost, broken, or stolen). Make sure you check the weather before packing your clothes…it can be really cold…or it has been very warm…dress accordingly! Anything else you would bring to camp for the weekend, including jackets and sweatshirts, depending on the weather. Watch for more information as the date approaches. iPods, cell phones (WE WILL HAVE A CELL PHONE BAG THAT WE WILL HAVE STUDENTS PUT THEIR PHONES IN DURING SESSIONS AND QUIET TIME – or, optimally, they can leave them there the whole weekend if they like), alcohol, fireworks, tobacco products, drugs, firearms, knives or pets. Leave electronics and anything illegal at home, please.